Dr Awwad grew up in Dallas Texas, learning strong work ethics and honesty from an early age. He earned his BDS from the University of Jordan, and later in 1999 earned his DDS in California after taking the National and California Boards. 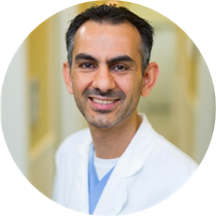 Dr Awwad has been practicing in California for over 18 years, always keeping up-to-date on many continuing education courses, ensuring that his patients receive the most comprehensive and advanced dental care. Dr Awwad is also a Loma Linda University AAID MaxiCourse graduate. Aside from the love of delivering honest quality dentistry , Dr. Awwad loves spending time with his wife and four children, especially with his boys cheering for their hometown teams , the Cowboys, Rangers , and Mavs. I love Dr. Awwad's mannerisms, professionalism and gentle nature. He truly takes his time and explains everything very well. Tells you step by step on what he's doing. That helps put me at ease. He does great work! His staff isgreat, very courteous and office is always very clean. They are not pushy about treatments needed and allow you to take your time on deciding whenever you're ready. I would highly recommend him to EVERYONE!!! I give his office five stars for sure. ?????????? Love this dentist! He sees my mentally disabled adult daughter. He and his staff are always very kind and patient. My daughter is not always cooperative, but they take the time my daughter needs to feel comfortable. Highly recommend! Very caring, took the time to fully explain treatment and results. Entire staff was very professional and friendly. Dr. Awwad is the best! We moved away but still travel over an hour just to keep him as our dentist! Very friendly staff as well as making it a priority to work with my schedule due to me running late! He's very nice and informative. Always smiling. Love Dr. Awwad. I have been to a lot of dentists and he by far is THE BEST. My husband and I have recommended everyone to go to him and we will continue to recommend people. Dr. Awwad truly cares abouthis patients and is a very good dentist as well. Dr. Awwad and his staff are amazing. My husband has a very busy work schedule and it's hard for him to take time off so it's nice to know that he is able to take care of his dental needs on Saturday's. We highly recommend this office. I was very happy with my appointment! I broke my tooth and was able to get in quickly. He was as gentle as he could be and checked on how I was feeling quite often. He and his staff were amazing!I am permanently saying goodbye to my old dentist. I highly recommend Dr. Awwad! Everybody in this office is really nice and professional. From the front desk lady Erika she is alway nice and always try to help you with your appointments and payment, to all the ladies that help Dentist Moher, they are niceand really careful when they doing their job. And last but not least Dentist Maher Awwad, He is really nice and he cares for his patients. His professionalism speaks for itself. Wonderful dentists and staff too. Great Dr. who is kind, gentle, and honest! No one is honest anymore! Dr. Awwad is. I have PTSD and have major anxiety to dental work. Dr. Awwad took his tome to explain things to me, make proper recommendations and took the time to answer questions. Great staff too! Always a pleasant visit. The office is great with children. I liked it, it was my first visit! Very wonderful bedside, thorough and clear, genuinely a caring doctor who performs great work! I've been coming to this practice 5 years. Wonderful staff all around! Dr. Awwad is the man! Got into Prestige Dental Group on an emergency toothache from a half-broken tooth and the experience has been nothing short of pleasant and perfect. Dr Awwad hasn't even started treatment on my tooth but without adoubt and any hesitation, I can give him 5 stars for outstanding service, care, cleanliness, comfort and his expertise. Because of strangeness in one of the tooth's roots and thus possible complications during the root canal, he referred me to a specialist, whom he found himself by calling around for a same or next day appointment. Talking about going above and beyond for your patients. Also, because he knows about German soccer and my favorite team he actually deserves 6 out 5 stars. Just saying. Priorities people ;) Thank you Dr. Awwad and the very friendly staff at Prestige Dental! Always very friendly and explains everything so you know what to expect. Also, always makes sure you are as comfortable as possible. I tried this Doctor by recommendation of my friend and I am glad I did. The office was very clean and the woman in the front was extremely nice. The doctor and his assistants truly care and made sure I was comfortable the whole time. Amazing office! Dr. Maher Awwad is one of the best Dentist that have done dental work on me also the staff that work with him are friendly and professional. I highly recommend Doctor Awwad and he's group to everyone. He's a great dentist I highly recommend him and would trust him with my pearly whites again. Today I had my tooth extracted and he was so gentle and very comforting and catering to my pain. I will be back for routine care defiantly. Dr. Maher Awwad, DDS has no appointments on Zocdoc right now.